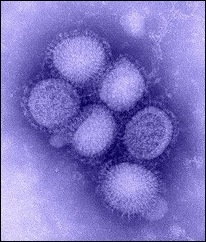 It seems like everyone has been talking about H1N1 (swine flu) the last couple of months. If you have children in school, then you are probably very aware of how fast the virus is spreading. Schools are the perfect environment for a virus to spread. To help understand why, we created a STELLA model of a high school that introduces the H1N1 virus. You can experiment with vaccination and “stay at home” policies to limit the spread of the flu. The STELLA model is based on the SEIR compartmental model that epidemiologists use to model the progress of an epidemic. SEIR models divide the population into compartments: Susceptible, Exposed, Infected and Recovered. These ‘compartments’ translate nicely into stocks within the STELLA model where we can observe the dynamics of the spreading virus. While developing the model we decided to explore some strategies that schools are pursuing to limit the virus’ spread. We wanted to know if the “stay at home” (when you are sick) policy would be effective in the case where vaccines are not available quickly enough, (which as of November 2009 is the case). Click the ‘Simulate’ link on the home screen above and try some different scenarios. Be sure to click the ‘How does this simulation work?’ link for a guided tour of the model behind the simulation. How does varying “% vaccinated” effect the number of sick students? How many days do infected students need to stay home to have a significant impact on the spread of the virus within the school? What impact does the “% effectiveness of vaccine” have on the flu outbreak? What combination of decisions results in the lowest number of sick students? Are these decisions realistic in a real-world setting? Note: Each time you dial in parameters and press run, a new plot will be added to the graph so you can compare the effectiveness of the different decisions. Clicking on the blue reset button will clear the graph and reset all Knobs to their default value. If you think this simple model is useful, feel free to share it or embed it on your own website; just click the sharing icon in the lower right corner. If you want to dig deeper into the STELLA model you can download the model by clicking here. You can open the model with STELLA 9.1, or the free isee Player.